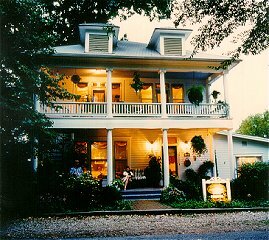 Gracious southern hospitality makes this elegant, immaculately restored Bed & Breakfast Inn the perfect place to have that much needed "get-away", or to celebrate your special occasions, we'll even assist with. your elopement and make it easy for you. Sony prepares a breakfast that is becoming famous in our area (you won't need lunch). Beautifully appointed rooms, totally private 3-room double jacuzzi suites, with full kitchens. Stocked coffee pots and electric tea pots in all guest areas, robes and candies in each room. Lots of light, rich color schemes, and tastefully furnished. Truly excellent location, on a quiet street, within easy walking distance to historic downtown. Level parking front and back. Whatever the reason for your visit, we will help make it an event to be remembered. Sony's gourmet breakfasts fill you up and start your day off right, his breakfast bread is becoming famous in our area. We offer personal service that can't be beaten! Visa, Mastercard, Discover. Personal checks & of course Cash accepted. This and other Eureka Springs Bed and Breakfast Inns can be found here in The Register. Romantic Country Inns, Getaways and B&Bs offer a great Ozark lodging alternative to big hotels.